Proper Hunt: Happy Anniversary Crane & Canopy! Happy Anniversary Crane & Canopy! 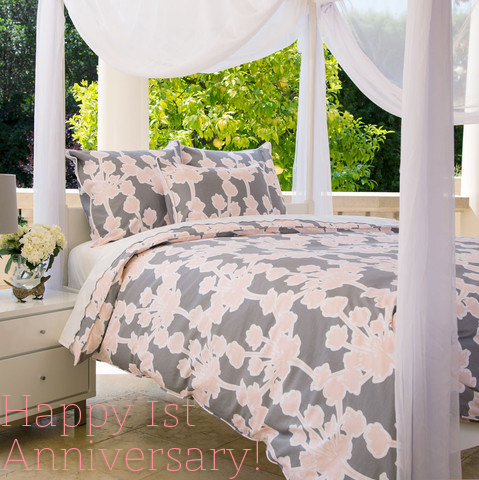 One of my favorite bedding companies, Crane & Canopy, is celebrating their 1st birthday today! And in honor of their birthday, they have released their anniversary duvet, the Ashbury, in pink. The Ashbury is one of my favorite collections that they offer, and to have it in this whimsical pink just takes the cake. They didn't stop there with the birthday cheer. They're also thanking all of you with an additional 15% off ALL orders over $150 with the code HAPPYBIRTHDAY at checkout from now until 7/21/13. So hurry now and get your bedding orders in before you miss out! I've had the pleasure of corresponding with Karin, the co-founder, and can tell you that she is one of the nicest people I've ever met! Or rather emailed with, since we've never met in person before (hopefully one day!). They have a great vision for the bedding industry and they are really, really nice people! Happy Birthday Crane & Canopy! You saved my day! I need a duvet cover for my new bed and was not pleased with what I was finding. Serena and Lily, as much as I wanted the Catalina, was more than I wanted to spend. These are beautiful -- and on sale. Thank you! !